Gamorrean Guard 1983 STAR WARS Complete VINTAGE Original A4 NO COO Rare! Gamorrean Guard 1983 STAR WARS Complete VINTAGE Original B1 NO COO Rare! Gamorrean Guard 1983 STAR WARS Complete VINTAGE Original A2 NO COO Rare! Vintage Star Wars 1983 Squid Head & Gamorrean Guard All Original! Lot of 2 Nice! Vintage Star Wars 1983 Gamorrean Guard E N Mint "Vintage Complete" w/Card Back! 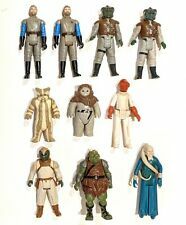 VINTAGE STAR WARS, ROTJ, GAMORREAN GUARD ACTION FIGURE - COMPLETE - GOOD COND. This page was last updated: Apr 25 06:21. Number of bids and bid amounts may be slightly out of date. See each listing for international postage options and costs.